With the enormous increase in the taxation of dividends, high net worth investors may be tempted to abandon dividend-paying stocks entirely. This is not necessary. Corporations will reduce their dividend payments. And wealthy investors can use strategies to alleviate some of the effect of these tax increases. Here is the tax problem and its solution. Stocks that pay significant dividends are a subset of value stocks. Some companies pay earnings to shareholders in the form of dividends. Other companies retain their earnings in an effort to put that capital to work expanding the company’s value. Apart from differences in taxation, these two options should be equivalent to the shareholder. Imagine buying shares in a company whose stock is trading at $10 a share with earnings of $1 per share. The company has a price-to-earnings (P/E) ratio of 10. If the company paid all its earnings in dividends, it would take you 10 years to get paid back in earnings. After a decade you would have both your money back and also still own the stock. And if you used your dividend to purchase additional shares, you would own 2.594 times as many shares thanks to compounding dividends. Now imagine that same company decides to retain its earnings and use them to grow the company’s physical locations by reinvesting the 10% each year. In that same decade the stock price would rise to $25.94. Whether a company chooses to pay a dividend or retain earnings doesn’t make a difference economically. This is true so long as they are taxed the same. This year qualified dividends or capital gains are both treated favorably in the tax code. But starting in 2013, qualified dividends will no longer exist. They will not be eligible for a lower tax rate. They will all be taxed at ordinary income tax rates, which can be as high as 44.6%. The top federal tax rate rises from 35% to 39.6%. A 3.8% Obamacare tax and 1.2% more in deduction phaseouts bring the total to 44.6%. California’s latest ballot measure raised its top state tax rate from 9.3% to 12.3%. This puts the marginal personal tax on dividends at 56.9% after corporations have already paid their own 39.6% rate. Doubly taxing dividends means a high-income shareholder might only receive $26.03 per $100 of corporate income. 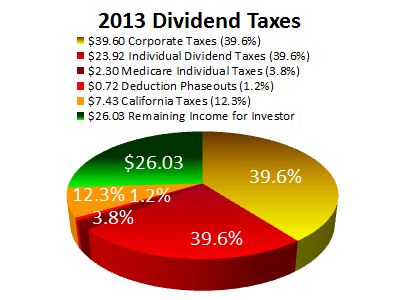 Next year in California the effective top marginal tax rate on corporate dividends rises to 74%. Perhaps you think the rich can’t be taxed enough. But such bigotry is economically destructive. It is like limiting the number of basketball shots your most well-paid player is allowed to throw. When the team wins fewer games as a result, everyone’s salary is affected. High marginal tax rates will drive businesses out of the United States just as they are being driven out of California. This will hurt rather than help the country or the state pay for its profligate spending. The 74% taken from the most productive entrepreneurs represents the missed opportunities of economic expansion, employment and investment. These costs cannot be expensed for new ventures. They must be paid for in after-tax dollars. If I run one business and want to start another, the money I invest in the second business is not tax deductible in any way. If I want to expand an existing business by buying additional physical locations, this capital outlay cannot be expensed either. These outlays must be funded with after-tax dollars. And when expansion and employment are curtailed, it is the most vulnerable in society who suffer the most. And when I analyze the return on investment (ROI) of a potential venture, my calculations have to include the after-tax result of what I might gain. For the most productive members of society, our progressive tax rate removes the incentive for investment. Whereas low-income people would have a great ROI but do not have the capital, high-income people are faced with a poor ROI because of their tax rate. Dividends and capital gains produce equivalent gains, but their tax rates will now be very different. The top marginal tax rate for dividends is rising from 15% to 44.6%, but the top rate for capital gains is increasing from 15% to 25%. In 2013 this number is calculated by a 20% capital gains tax plus 3.8% for Obamacare and an additional 1.2% for deduction phaseouts. Taxing capital gains at 25% while taxing dividends at 44.6% will result in fewer companies paying dividends. This will in turn have an effect on the dynamics of the market. The double taxation of dividends and capital gains continues to reflect the populist bias of those who don’t understand basic economics. Until dollars are treated equally, it is best to be wary of the tax code and adjust accordingly.